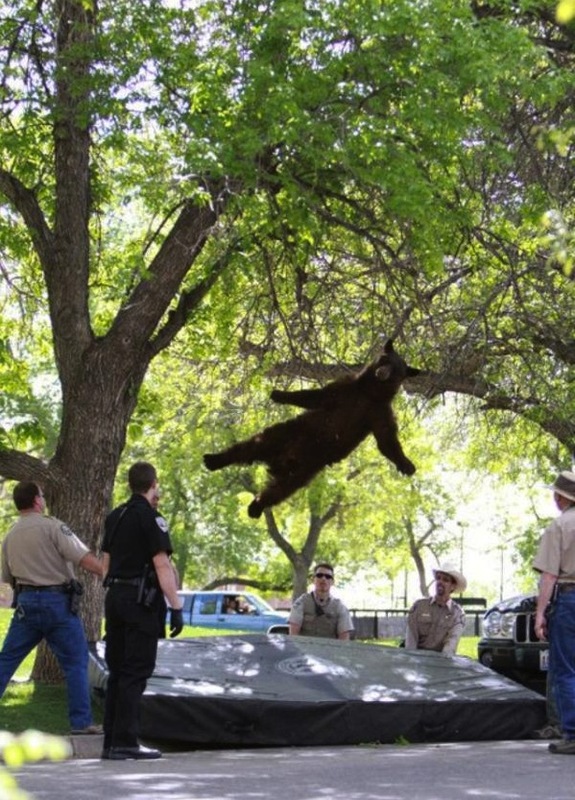 In a truly memorable moment, a bear can be seen falling from a tree after being tranquilized by police in Colorado. The young bear, estimated to weigh between 150 and 200 pounds, had wandered onto the University of Colorado at Boulder campus and climbed into a tree, according to the CU Independent, which captured the stunning image. "[The bear] was tranquilized by the Colorado Parks and Wildlife Department and it fell onto some mats that the Rec Center provided," CU Police Department spokesman Ryan Huff told the paper. "It is now in a cage and it will be relocated at a higher elevation." Before it was tranquilized, the bear spent about two hours in a tree near the campus dorms. It reportedly landed safely. On Tuesday, a family of black bears made the news, literally, after wandering onto the set of a local TV news station in Pennsylvania. • Meet the man who sells testicular implants for dogs: "People thought I was nuts"